In most parts of the country winter means putting the fun cars away or at least swapping on the winter tires and loading up with emergency supplies. In Texas, winter means swapping on the race tires and loading up the car with race pads, race tires, and emergency track side repair tools. After months of oppressive, power robbing heat followed by the wettest fall on record we finally got a great weekend for a trackday. Predictably, two weeks prior the ABS light on my 2014 BRZ came on, I checked all the fuses and did a visual inspection of everything I could think of before heading to the dealer (they’re just a couple miles from my apartment and took great care of me while I was under warranty, which of course ran out just over a month ago). They ran a diagnostic and told me that my ABS pump had failed and quoted me $2000 for the repair, ouch. It would take a week or two to get the part so it wasn’t going to be ready before my trackday; however, trackdays don’t really require ABS or traction control. I had planned to replace my wheel bearings this year, a few of get together and use the shop and lift every January to do annual maintenance and the parts were on order. Photo: Do you even lift bro? I had a suspicion that my problem might have been a bad wheel bearing, the front driver’s corner was making noise and I originally thought it was just the drooping fender liner rubbing on the tire; however, after removing the loose sections the sound persisted so I decided I’d change the hub as soon as it came in (delivery was scheduled for Thursday and I wasn’t going to the track until Saturday). The Hubs were delivered Friday night, after 7pm during a cold rain (I do all my wrenching in my apartment parking lot and I wasn’t too excited to do the job in the rain after dark). Saturday’s forecast was a high of 45F and overcast, but dry so I decided to tackle the job in the morning at the track. I had volunteered to instruct at the trackday (gets me a free entry and I like giving back), so I had to be there even if my car wasn’t race ready. I decided to leave extra early. 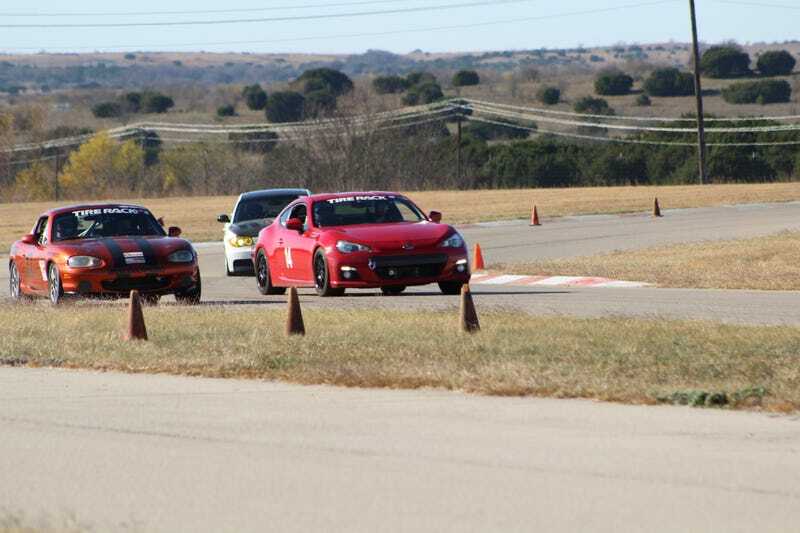 I’m just over an hour from Motorsports Ranch in Cresson and the instructors’ meeting was scheduled for 8am, if I couldn’t fix everything I’d at least be at the track and ready to instruct. I put all the tools I’d need in the back and got to sleep as early as I could. I was the first to arrive on Saturday and had the wheel off before the event organizers showed up to start setting up for registration. Everything wen’t smoothly until I had all the bolts off and just had to pull out the old hub (they just slide in...) but the bearing had failed catastrophically (the wheel speed sensor was covered in grease from the sealed bearing). I had to use a flat-head screwdriver as a wedge and hammer it between the hub and its mount to pry the old hub out. I hadn’t checked the time but the paddock was filling up and people were filing into the clubhouse. The sun had been up for awhile and I knew that I didn’t have long before the meeting started. Thankfully the hub relented and the replacement went in without any issues in just a couple of minutes and just as the call for the instructors’ meeting to start. I had everything ready to go, aside from bedding the race pads but that’s what the first session is for. The repair was a success and during the out lap my ABS light went off, the pump was fine, the wheel bearing was the problem (I had mentioned this to the dealer but they either didn’t check and/or are incompetent). As far as I was concerned the day was already a success. I took the first session pretty easy and just focused on first making sure the car was working and the wheel wasn’t about to fall off and once I was sure everything was in working order I just bedded the brakes without trying for any actual fast laps. My novice student was in a Camaro SS 1LE, luckily he had some track experience and I recognized him from autox. My assigned intermediate student didn’t show up so I filled in by hopping into 718 Boxster S, after the first session I was reassigned to 718 Cayman S. Both my students took instruction well and were easy to coach, they also ended up being either the fastest or second fastest drivers in their run groups. I spent the whole session playing the rabbit to one of my buddies in his Mustang GT, turns out he had my passenger’s friend and for the next session they swapped. I had another great session and actually ended up setting a new PB (personal best) with a passenger! I was having a blast and it was only lunch time! I ran the next 2 sessions solo and set new PB’s in each getting all the way down to 1:23.9s (picking up nearly a second over my previous PB). I skipped the last session of the day to give myself extra time to load up (I was still one of the last 2 people to leave since I had just shoved my tools and parts out of the way just to get on the track on time). I didn’t think I would every get into the 1:23's on street tires in my car. That’s a respectable time for Corvettes let alone my BRZ. I can’t wait for next week’s SCCA Time Trial!